The concept that glaciers and ice sheets have different responses to ocean and atmospheric climate, depending on a specific time-scale, is an appropriate but not the only way to organize this chapter. 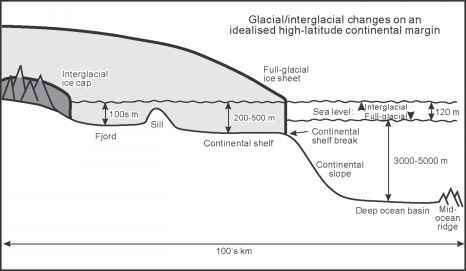 On the decadal to century scales, such as the Little Ice Age (LIA), then the changes in glacier extent are largely a function of changes in glacier mass balance, which in turn are linked with changes in ocean and atmosphere climates (Fig. 21.2). On the 104-105yr scale (the Milankovitch or orbital time-scales), however, changes in glacier or ice-sheet extent are influenced by other, non-climatic factors, such as glacial isostatic depression of the crust, which can have a major effect on ice-sheet mass balance, especially if they terminate in the oceans. Furthermore, with new data on the changes in the greenhouse gases CO2 and CH4 during several glacial cycles (Ruddiman, 2003a,b) then it is imperative that the role of the biosphere be an integral part of the total system (Fig. 21.1). Indeed, there are some who argue that variations in CO2 are either the primary driver in climatic change (Royer et al., 2004) or an important amplifier (Shackleton, 2000). 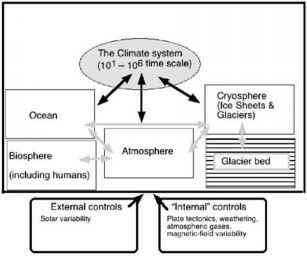 Figure 21.1 The global climate system as it pertains to glacier responses to and with climatic change. Earth's climate system? The term 'climate' is usually interpreted to represent long-term, integrated records of temperature, precipitation, cloudiness, etc. 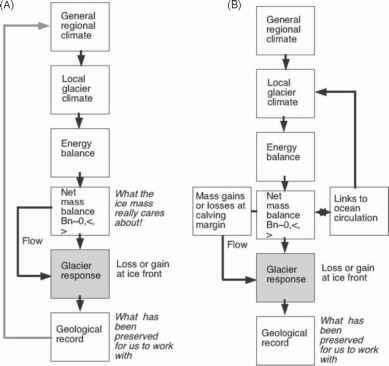 In reality most climatic interpretations of glacial responses are couched in terms of temperature changes, although in reality the ice body responds to changes in mass balance, the product of both temperature and precipitation (Meier, 1965). Modelling the response of ice sheets to various climatic scenarios (see Marshall, this volume, Chapter 32) has great promise to extend our knowledge of the relative importance of the various forcing functions as they vary temporally and spatially. This chapter evaluates the evidence for recent and future glacier-climate relationships and interactions, and then examines data associated with the Little Ice Age, Holocene glacial intervals, Heinrich and Dansgaard-Oeschger oscillations, and some comments on issues associated with the orbital forcing of global glacial cycles. Earlier surveys of the topic include the papers by Meier (1965) and Porter (1981), and the various editions of Pater-son's book are an invaluable source of information (Paterson, 1969,1981,1994). A concise review of the issues involved in modelling the dynamics of ice sheets is given by Hindmarsh (1993). A conscious effort is made to include a broad temporal range of references.